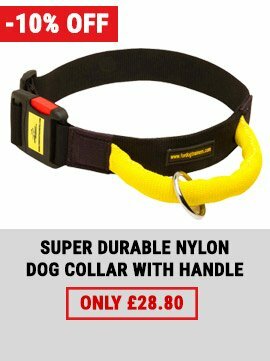 Pinch dog collars are specially made for such strong and vigorous breeds as Pitbull, Amstaff, Stafford and alike to correct their behaviour and to teach them obedience. 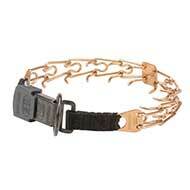 We offer a great variety of different corrective chain dog collar types and sizes. 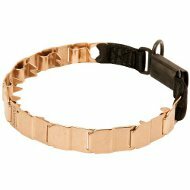 Pinch dog collars and neck tech prong collars by Herm Sprenger (Germany) are available on this page. 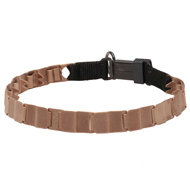 Every of our prong collars for dogs has no sharp ends so you can be at ease about your dog’s fur and skin. 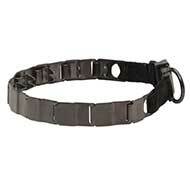 You can always order a nylon protector for a pinch dog collar. 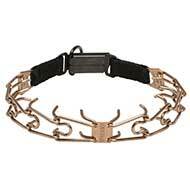 It preserves the metal dog collar and anyone can’t guess about your Pitbull's behaviour problems. 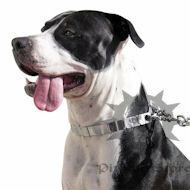 If you are looking not for a prong dog collar, but for a regular chain collar, visit this page. 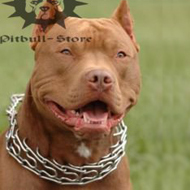 Do you want a tasty offer from Pitbull shop? 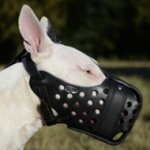 Get 10% discount on all the products from this page! 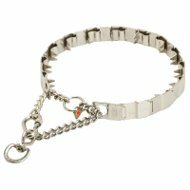 Simply put the discount code 7788 into the coupon field when you make your online order. 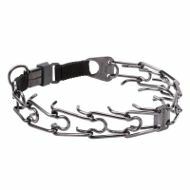 Model: HS39#1047 50051 014 (55) NECK TECH Dog Collar of 24"
Stainless Steel Collar for Pitbull, NECK TECH Design, 19"
Model: HS38#1047 50051 010 (55) NECK TECH Collar of 19"
Pitbull Pinch Collar with Small Quick Release Snap Hook, 1/6"
Extra Link for Prong Dog Collar in Antique Style, 0.1"
Cool Offer for Powerful Pitbull Owners! 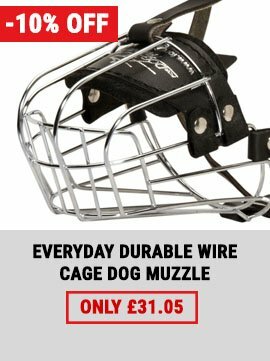 Only today you get a 10% discount for all the dog gear except bite sleeves and bite suits. 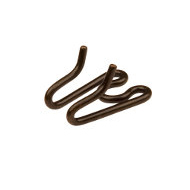 7788 is a coupon code. 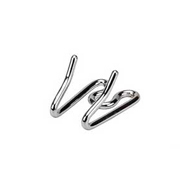 Don't miss a chance while the discount coupon is in action! 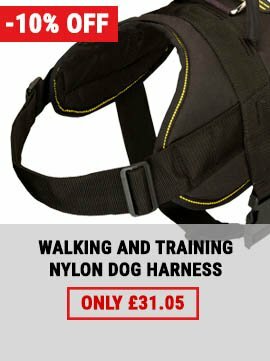 You can check the coupon availability here. 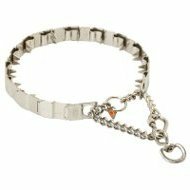 Fill in the coupon code and see its availability. 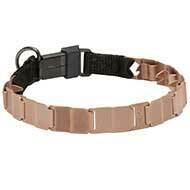 It`s very important for a dog silent collar to be absolutely safe for dog`s health and hair, that`s why the best K9 experts designed such matal dog collars that won`t do any harm to your dog`s neck and will save its fur. 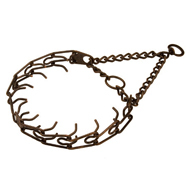 it by the scruff of its neck and your pet calms down. 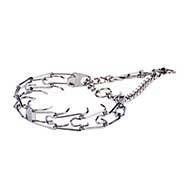 That`s why our choke chains provide gentle education of your beloved pet. 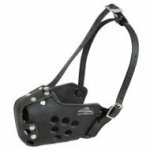 Our Pitbull shop offers such dog training collars as pinch collars, chain collars and choke chains, fur savers, usual metal collars. 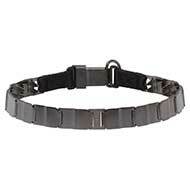 Pinch collars you see on this page are supplied from the producer in Germany. 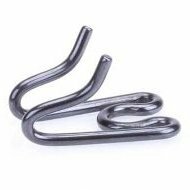 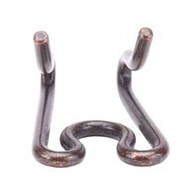 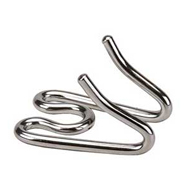 Herm Sprenger is a well known name in the world, a leader in metal dog accessories industry. 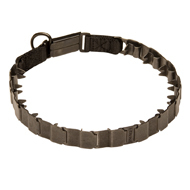 You are welcome to see and appreciate our Herm Sprenger metal collars collection. 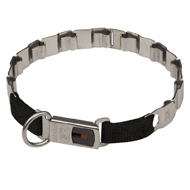 You can also add our brand leather or nylon fittings to the metal collar you`ve chosen. 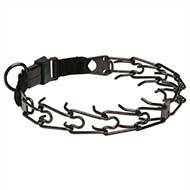 We propose a nylon cover for every pinch collar. 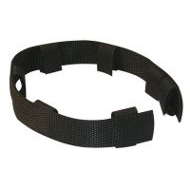 Different lengths and widths are available. 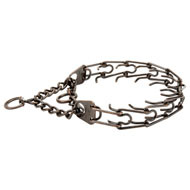 All Herm Sprenger choke collars and chains are made chromium plated steel, stainless steel, brass and curogan. 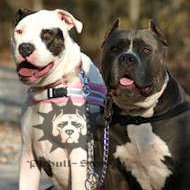 Curogan is one of the most popular alloy on Pitbull market, it is the best material for your dog`s fur and skin. 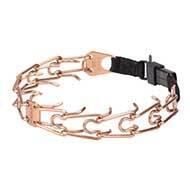 Metal collars look very stylish and have a unique design, because we do not have our shops offline. 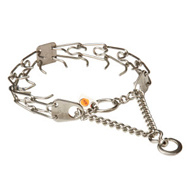 So buying here be sure that you get a unique dog collar for your pet. 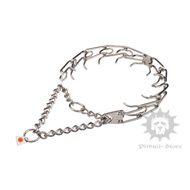 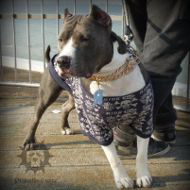 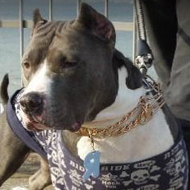 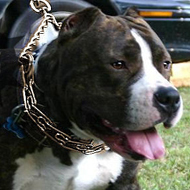 Your Pitbull or Amstaff will look gorgeous at any situation with our choke chain. 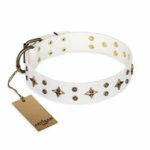 Received my order yesterday afternoon - I am absolutely delighted - it is gorgeous the quality is superb and it certainly makes my Staffie look like a king! 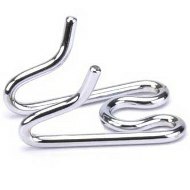 I am so very glad that I found you and I will certainly recommend you whenever I can. 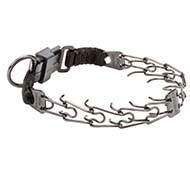 Again - thank you.